Just a friendly reminder that intellectual property rights are an important incentive for breeders to develop new and improved varieties. For example the Plant Variety Protection Act (PVPA) is a federal law that gives owners and developers of new varieties the exclusive right to control the production and marketing of those varieties for planting purposes. It was established to promote development of new varieties and allow breeders the ability to generate funds to use for future research and variety development. In general, there are two exemptions under the PVPA. Pat Tranel and graduate student Brent Murphy, University of Illinois, have developed a way to identify Palmer amaranth DNA from within a mixed seed sample without having to grow the plants or test individual amaranth seeds. The assay, which uses a method known as quantitative PCR, can detect genetic variations unique to Palmer amaranth even when flooded with samples from closely related species, including waterhemp. This type of testing brings the ability to test for Palmer amaranth to every stage of the seed cleaning process. It is not uncommon to find hundreds of amaranth (pigweed) seeds in an unclean or raw seed sample taken just after harvest. Testing of hundreds of individual seeds is expensive. This expense makes cleaning the lot prior to testing more attractive. After the lot is cleaned, packaged and ready for sale a sample is submitted and any remaining pigweed seeds can be tested. But with the new bulk method, testing prior to cleaning makes more sense. Diane Plewa and Elizabeth Phillippi at the U of I Extension Plant Clinic optimized the test for routine commercial use and up to 100 pigweed seed can be tested for $50. Doug Miller, CEO of the Illinois Crop Improvement Association, applauds the development of the test. “I would want to test all of the pigweed seeds found in the raw seed sample” says Miller, “in my opinion the raw sample would better represent what species were present in the seed producer’s field.” Miller goes on to say that 1 or 2 pigweed seeds from a sample drawn from a cleaned seed lot are survivors of a larger population originally in the seed lot. This finished sample is representative of the seed lot that is for sale, but with the new bulk test a more powerful test can be routinely used pre and post cleaning. The Illinois Crop Improvement Association created a blind sample set for final validation of the method. The Plant Clinic results were a 100% match, identifying Palmer amaranth from three different sources at different levels within each pigweed sample. I recently visited the Illinois Crop Improvement Association Puerto Rico Research Farm with Doug Miller, Chief Executive Officer of ICIA. This was my first visit to the farm and as a Board member of ICIA, interested in learning more about the activities happening there. Doug had a very full 3 day schedule prepared for us. Upon initial welcomes first thing in the morning, I was impressed with the extremely friendly staff at the site. During the morning staff meeting, it became very evident the desire to work together to meet the expectations of each and every research project on the farm. What a great team! A visit to the lab gave an insight into the equipment used for evaluation of seed samples, plant diagnostics, and tissue sampling, handling, and drying requirements for clients. As we traveled out to the production area, I noted how clean the plots were…excellent weed control, careful monitoring of irrigation activities, timely planting, spraying and harvesting, insect monitoring, and fungicide applications….all very professionally done. A lot of pride and “ownership” was evident as I visited with staff members about their activities. This is just what I would want if I had a project there! It is a misnomer that Palmer amaranth can be definitively identified by visual analysis of the seed. The NRCS website lists 49 Amaranthus species. Other weedy members of the genus include smooth pigweed, prostrate pigweed and waterhemp. All amaranths have similar seed morphology requiring additional analysis to definitively differentiate seed to the species level. However, seed analysts are being asked to analyze samples of feed, seed, and other agricultural commodities originating from areas where Palmer amaranth is common. Currently the seedling growout method is the most readily available technique for identification to the species level. Molecular testing of leaf tissue samples can be performed (University of Illinois) and the direct testing of Amaranthus seeds appears promising but is still under development (California Department of Food & Agriculture). Time, space and cost make any identification technique an added investment to seed testing. Click here for the rest of the article. (Oct 2016) Amaranth growout pricing here. We are proud to report that corn growouts are in good shape this year. Hannah Hudson, Operations Manager, visited the farm last week and sent back good news along with the following pictures. For those of you that have been sharing with us stories of insect damage at your locations we ask that you not condemn the entire island. We have reason to be proud and are "tooting our own horn" so to speak. Illinois Crop Improvement's Winter Farm is committed to delivering the best quality possible. And we are having another successful season of corn, sorghum, soybean, sunflower, peanut, dry bean and spring grains work on the island. As a member driven not-for-profit organization we strive to improve for the benefit of our customers. I am proud of the leadership the team has shown and I invite you to see for yourself what we can deliver. Click here to view photos of Puerto Rico's Winter Farm! The US Grains Council posted the 2015-2016 Corn Harvest Quality Report (http://www.grains.org/). Illinois Crop is asking for more transparency among the regions of the National Plant Diagnostic Network to ensure accurate diagnosis of submitted samples. This letter was forwarded today to the National Program leader by the Director of the Illinois Plant Clinic. The Illinois Crop Improvement Association is accredited under the USDA-APHIS National Seed Health System for the field inspection of seed crops during the growing season. Our accreditation is valid for all sites and locations throughout Illinois and Puerto Rico, where we have a winter farm and station. As part of our accreditation inspectors submit plant samples to the University of Illinois Plant Clinic or the University of Puerto Rico pathology lab. When the pathologist at the University of Puerto Rico is out, due to travel and education duties, samples are sent under permit to the University of Illinois Laboratory. During a recent meeting at the University of Illinois Lab it came to my attention that the plant disease diagnostics network does not allow access to laboratory results outside of their region. While the diagnosis of diseases on corn and soybean samples from Puerto Rico has not yielded any exotic or unknown pests I believe it is important to allow regions to share pathology and pest information. There is an active shipping channel between the US Mainland, Puerto Rico, Hawaii and Florida during the fall and spring. Plant breeders and parent seed producers produce more than one generation of seed per calendar year using the afore mentioned winter locations. Local college students in and around the Champaign-Urbana area have long had the advantage of visiting Illinois Crop Improvement Association, Inc. located in Research Park. The history and purpose of the organization is first on the agenda followed by a tour of the various certification, lab and greenhouse facilities. “The only thing we can’t show them directly is our Puerto Rico Winter Farm” says CEO Doug Miller. Pictures of off-types, seed increases and sunshine pales in comparison to being just off the Caribbean Sea in January and February. Students are often surprised that Illinois Crop works in a tropical location with Illinois exotics such as cotton and peanut. The Directors of the Seed Lab, Field Services and Identity Preserved Grain Lab take turns discussing scientific procedures and rules for seed testing. It is a good experience for students and hosts. Students learn and the hosts learn how to present their role in the seed and grain industry. Some of the “tourists” come back as part-time student workers. “Ag kids are the best” says CEO Doug Miller, “dependable and eager to learn about different roles in agriculture.” It’s a win-win relationship. 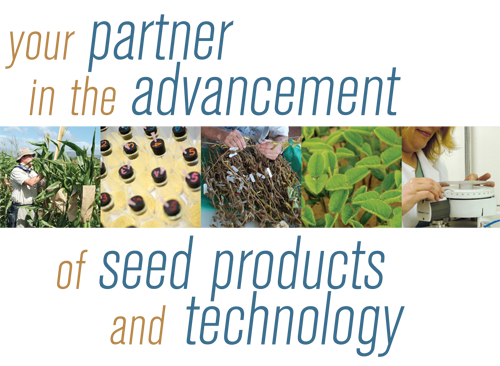 The U.S. Department of Agriculture’s (USDA) Animal and Plant Health Inspection Service, Biotechnology Regulatory Services (APHIS/BRS) has recognized one additional organization that has voluntarily established a Biotechnology Quality Management System (BQMS) to enhance compliance with the regulatory requirements for certain genetically engineered (GE) organisms. The organization is Illinois Crop Improvement Association, Inc., Juana Diaz, PR. According to CEO Doug Miller “It is no small achievement and we are proud to have passed the BQMS audit.” The association’s management and staff understand that they are caretakers of their clients’ physical and intellectual property regardless of how it was developed. “Preserving and assuring the integrity of seeds, plants, and information” is what we do says Miller. Cold Tests, Saturated Cold Tests and Pericarp Damage results help predict how seed will perform in extremely adverse growing conditions. Keep in mind that these are vigor tests and are not covered under AOSA rules or the tolerances used for standard germination testing. Vigor results do not appear on seed labels and with good reason. The AOSA, Association of Official Seed Analyst, has recommended procedures for vigor testing that the IL Crop Seed Lab follows. However, these tests put seed under extreme stress that can be akin to breaking bones to determine how much milk you drink. There are variations in the soil or media used by each lab and seed that is on the lower spectrum of seedling vigor generally show more variation. Higher seed vigor generally produces less variation in results within and among labs. Therefore, vigor results may vary from laboratory to laboratory and even from sample to sample. Sampling is very important. It is crucial to obtain a sample that represents the entire lot of seed. There are many other factors that can play into variation in results such as, but not limited to, the environmental conditions during the growing season, seed handling, storage conditions, and even genetics. But this is why companies run these kinds of tests for marketing and shipping decisions. The IL Crop Seed Lab has seen an overall decrease in the vigor testing result averages for the 2012 seed crop, specifically in the saturated cold test and pericarp damage test. The overall average on saturated cold tests that have been tested in our lab has decreased from 72.2% last season to 67.2% this season. We have seen an increase in the amount of seed with moderate to heavy damage in the pericarp damage test. Growing conditions in 2012 led to more round seeds compared to flat seeds, and it is common to see a higher level of mechanical damage in round seed. With 2013 planting pushing into May as a result of all the rain that most of us have been experiencing, the concern over extreme adverse conditions should lessen. 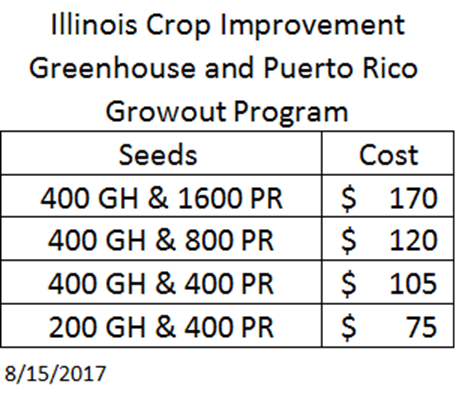 Germinations should be close to the rate indicated on the seed label. Once the seed germinates and establishes a stand the vigor tests and their results can be forgotten until the new crop of seed comes in and the race to plant early begins again in the spring of 2014.